For those in Sydney – this friday night is the opening of my ‘Sons of Privilege’ show at the brand new Lo-Fi Collective art space in Surry Hills. 27th August, 383 Bourke St, Darlinghurst – 6pm! 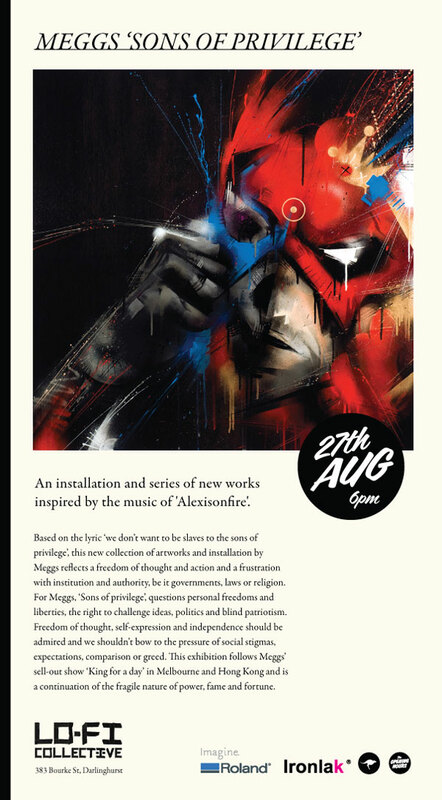 The show will only run for a week and features new original works and a large wall installation piece, so come on down on friday night if you can. More details on Lo-Fi here and an exclusive preview of new work below. peace. Thanks to Reese and Marty for showing me this dope location! Lone Wolf Rat styles. Backwoods Gallery debuts with my third Melbourne solo exhibition, King for a day. King for a Day is a brand new collection of paintings, screenprints and installations that examine society’s celebrity obsession through the prism of our own mortality and inner duality. An energetic depiction of those who crave power, wealth and fame in both life and death, King for a Day looks at how contemporary media and social networking has accelerated stardom and increased the pitfalls that come with celebrity attention. Please join us for the opening reception of ‘King for a Day’ on Friday 25th June 2010, from 6-9pm. Growing up in the suburbs of Melbourne, Australia, Meggs’ early artistic development was influenced by the cartoons, comics & sci-Fi films of the 1980’s. 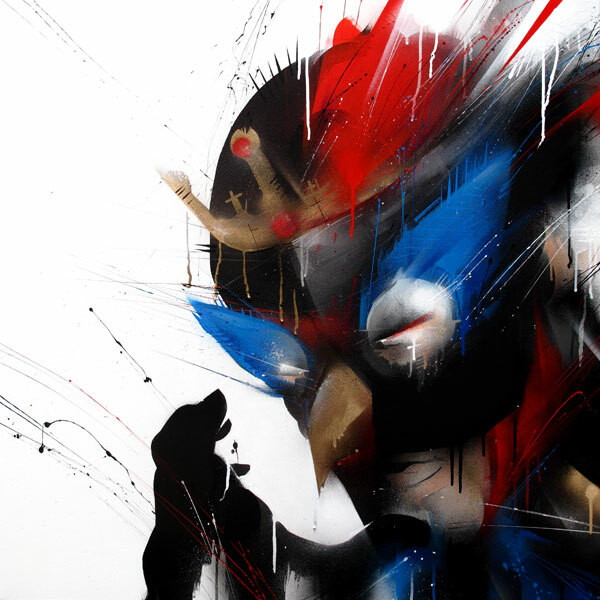 Fuelling his vivid imagination and creating a passion for superheroes, fantasy characters and bold colourful graphics, such as those found on toy packaging and video covers. This soon developed into a passion for skateboarding culture, graffiti art and graphic design. Several years after completing his Bachelor of Design, Meggs became frustrated with client based design work and began exploring his personal artwork on the streets, particularly in the form of stencilling around 2003. Meggs quickly developed a recognisable style of complex stencil images and paste-ups, as well as exploring character based aerosol work with underlying themes of demons and duality. Early works such as the ‘devil kids’ and ’spew blobs’ become familiar to the back alleys and laneways of Melbourne’s CBD and surrounding suburbs. In 2004, Meggs joined forces with artists Sync, Rone, Phibs, Reka, Wondalust & Meek to become a core member of ‘Everfresh’, a unique collective of street/graffiti/studio artists who are recognised as one of Australia’s most progressive and prolific street art collectives. Sharing skills, knowledge and passion Everfresh are now renowned and respected for their collaborative styles in group murals and exhibitions, as well as being accomplished individual artists with their own unique strengths and styles. Meggs’ work continually references the nostalgia of childhood heroes and villains, exploring the notion of ‘duality’ and an on-going question of morals, rights and authorities. Reflecting on personal experience Meggs produces energetic depictions of heroes, villains, and subverted collages of pop culture symbology. Spreading his street work as far as Paris, London, LA, SF and Tokyo, Meggs has also contributed to numerous group exhibitions both locally and internationally. His work has more notably been sold through ‘Artcurial Auctioneers’ (Paris) and is included in the ‘National Gallery of Australia’s’ (Canberra) permanent collection as well as a recent print aquisition by the Victoria & Albert Museum in London. Continually evolving his painting style with a continued passion for graffiti and character painting, pop-art and abstract expressionism has led to Meggs being well recognised as one of Australia’s pioneering street to gallery artists.